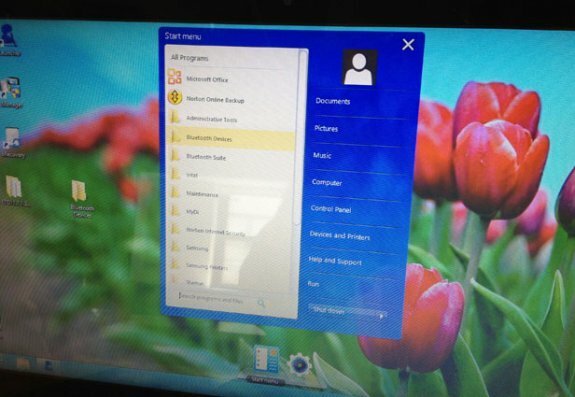 One of the things many computer enthusiasts dislike about Windows 8 is the removal of the Start button. Samsung seems to have taken notice as the new All-in-One PC it revealed yesterday sports S Launcher, a button that looks and feels like the good old Start menu. The widget lets you search your system, launch applications and it also gathers many everyday controls into one spot on the desktop. Sure, Windows 8 has native ways to search your system and call up settings, but as others have observed it’s not always in the most intuitive places. To anyone who’s been using Windows for a long time (read: the whole world), Samsung’s S Launcher is like seeing an old friend in a new country — it’s very reassuring. And of course, the S Launcher is also a launcher. Simply drag apps or files to it for easy access, tossing them off when you don’t want them anymore. Nothing groundbreaking in that, but it doesn’t hurt, either, and the icons are bigger than in the Windows taskbar.